West Seti project, 750 MW, is one of the best projects of its genre, because it not only generates peak-in energy – good quality power – but also does so at low cost and its implementation, further, results in flood control and dry season augmented flow for lower riparian areas. Moreover, export of hydropower to India from this project results in carbon offset benefit which is tradable in the carbon market and has potential as a good source of revenue. This paper has evaluated such benefits and also ascertained to whom such benefits accrue to, besides identifying costs, so far unaccounted for, and the incidence thereof. This project’s contribution to Nepal’s economic development could have been higher by a magnitude, if it is to be structured as suggested in this paper. In order to assess the contribution of this project to Nepal’s economy, an analysis of its benefits, costs and the allocation of thereof is called for; which is the very purpose of this article. In the meantime this paper will also assess percolation coefficient of the project. Higher coefficient indicates percolation of funds into Nepal’s economy at a higher level which contributes to Nepal’s economic development to the commensurate extent. This project is one of the best projects of its genre. It generates good quality power – the peak-in energy, that too at low cost even though it is a project with reservoir, building which is a costly affair. Further, its implementation results in flood control as well as dry season augmented flow for lower riparian areas. Moreover, export of hydropower to India from this project results in carbon offset benefit which is tradable in the carbon market and has potential as a good source of revenue. Power BenefitEven for run-of-river (RoR) projects the industry average cost of installed capacity in Nepal is above $ 2,000/kW. However, this project’s initial investment, as detailed below (SMEC 1997) is only $ 1,097 per kW at 1997 price level. The amounts are inclusive of contingency at the rate of 15% for civil works and at 10% for equipment, project management and resettlement, as provided for in the Detailed Engineering Report of the project. Built without a reservoir, the installed capacity of this project would have been limited to 100 MW. However, as this project has been conceptualized as a reservoir project, the installed capacity of this project has been fixed at 750 MW and it generates peak-in energy –3,636 gigawatt-hours (GWh) – which normally commands premium price in the electricity market. As its annual average generation (minus 10% committed for Nepal) is slated to be exported to India at the average tariff of $0.0495/kW, this project generates good quality power at cheap cost. NEA is buying electricity from RoR projects built by independent power producers (IPPs) in Nepal at around US 8 ¢, that too on “take or pay” basis which forces it to pay the same price for electricity during off hours and off season as well, which gets “spilled”. Moreover, NEA is importing electricity at around US 9 ¢ from PTC India. Besides, the avoided cost of peak-energy ranges from $0.20/kW to $0.375/kW, depending on the source of energy to the type of institution generating such power (cost being higher for NEA). However, PTC India recently proposed to sign PPA with NEA for 25 years to export electricity from India on “take or pay” basis at US 9.6 ¢. Similarly, it is interesting to note that Tripura in India had proposed to export electricity to Bangladesh at INR 7 (equivalent to US 16 ¢). This goes a long way to disprove that export tariff for west Seti power has been fixed at a lower level as its PPA duration is for 25 years. It does not require the knowledge of rocket science to understand that building a reservoir – to store water during rainy season and use the stored water to generate electricity around the year does indeed result in flood control during the wet (rainy) season and augmented flow during the dry season. In view of the fact that West Seti is a relatively small river compared to Karnali River (known as Ghagra in India), the flood control benefit due to the reservoir will definitely accrue, but may not be highly significant. The benefits of flood control manifests in the elimination/reduction of damages due to flood and also in terms of avoidance of expenditure in repairs, maintenance and rehabilitation in the aftermath of flood. Sometimes flood also displaces people and resettlement of them not only costs money but also costs in terms of human trauma and suffering. However, there is no information available on the quantum of flood control benefit from this project. Another form of downstream benefit is the availability of augmented flow in the lower riparian areas. According to Dr. Ananda Bahadur Thapa (1995) “After the regulation of the West Seti run-off the present dry season flow at dam site of about 45 cubic meters per second will be increased to about 135 cubic meters per second. Thus the net augmentation of the dry season flow could be about 90 cubic meters per second.” Additional flow as such is invaluable for purposes of both irrigation and water supply in the lower riparian areas. This quantum of augmented flow during the dry season (8 months) is worth $ 83 million (equivalent to Rs 6 billion approximately) annually based on the principle set forth by the treaty between Lesotho and South Africa. South Africa pays to Lesotho a lump sum of $25 million (in 1991 prices) each year to Lesotho for supplying 18 m3/s of water (both for the purpose of irrigation and water supply) from Lesotho Highlands Water Project (Wallis 1992). A mechanism could also be developed to share such benefit on the precedent set by the Columbia Treaty. Under Article V: “Entitlement to Downstream Power Benefits” of this treaty “Canada is entitled to one half the downstream power benefits”. The downstream power benefit has been defined by Article VII as “the difference in the hydroelectric power capable of being generated in the United States of America with and without the use of Canadian storage.” Drawing a parallel with the West Seti project, as the installed capacity of this project without a reservoir is just 100 MW, the power benefit of the construction of the reservoir is 650 MW and Nepal, under the principle established by this Treaty, is entitled to 325 MW. Unfortunately, the extant paper work between Nepal and the proponents of West Seti project has deprived Nepal of these innate rights. Nepal deserves to be recompensed for the downstream augmented flow based on the lines of agreement between Lesotho and South Africa or on the basis of the precedent set by the Columbia Treaty. Failing to emulate the principles set in one of these treaties, there is no point in implementing this project. It needs to be remembered that the data on augmented flow of 90 m3/s is based on the concept of building a dam of 187 m height, with a storage capacity of 1,600 million m3 and installed capacity of 360 MW only. With the increase in the height of the dam to 195 m and installed capacity to 750 MW there must be commensurate increase in the augmented flow. Emission of carbon dioxide (CO2) from the use of fossil fuel has resulted in global warming in a larger scale which in turn has induced climate change. In order to mitigate this problem, the Clean Development Mechanism (CDM) has been put in place which is a mechanism within the Kyoto Protocol that allows industrialized Annex I countries to implement projects that reduce emissions in non-Annex I countries (developing countries) and get credits for meeting their commitments to reduce emissions. Generation of hydropower does result in environmental additionality due to carbon offset by it, in not emitting green house gases (GHG) in the environment. As envisaged by Kyoto Protocol, trading in such carbon offset, also known as carbon credit, is already taking place. However, as Nepal is bereft of any fossil fuel exploration activity, and its use of such polluting source of energy as a source for electricity generation is negligible and, therefore, Nepal’s baseline is deemed to be the hydropower which doesn’t pollute. Because, under Kyoto Protocol, a country like Nepal with hydropower as its baseline, environmental additionality is not deemed to be accrued by generating additional hydropower for domestic use, except in the case of hydropower plant of up to 15 MW. Therefore, most of the projects are not considered to be generating environmental additionality. Whereas, as West Seti project, slated to export “clean” power to a country whose baseline is unclean, the transaction does succeed in offsetting CO2. In sum the export of electricity from this project will offset 3,458,160 tons of CO2 equivalent in a year while the reservoir will produce 2,194 tons of CO2 equivalent over the year resulting in a net offset of 3.45 million tons of CO2 equivalent. Such carbon offset has a market under Kyoto Protocol. Although the price of carbon offset ranges between $ 5 to $ 15 per ton of CO2 equivalent, for the sake of simplicity, using a median price of $ 10 per ton of CO2 equivalent yields a revenue stream of $ 34.5 million (equivalent to Rs 2.59 billion) per annum. In view of the numerous benefits, as described above, that construction of this project will result in, this is definitely one of the best projects of the genre. However, benefits don’t come alone and there are always numerous and matching costs. Besides the initial investment which is the financial cost to the project developer there are costs involved in building this project in terms of environmental degradation, submergence of forest, cultivable land, displacement of local populace, etc. that Nepal will have to internalize. The project’s reservoir inundates/submerges 25.1 km of the Seti River and a total of 28.0 km of five main tributaries (Chama Gad, Dhung Gad, Saili Gad, Nawaghar Gad, and Kalanga Gad) (WSHL 2007). According to the same report “The permanent project features will require the acquisition” of “659 ha cultivated land, 806 ha forest, 169 ha shrubs, 246 ha grassland, 9 ha abandoned land, 5 ha settlement, 409 ha river bank land and 23 ha rock/cliffs totaling 2,326 ha of land”. Similarly, 678 ha will be “utilized for the transmission line ROW.” In total the project will use 3004 ha land permanently. The acquisition of land as such is covered by the EIA report. The project proponent has plans on the anvil to resettle the displaced people by providing land in lieu of cultivated land. However, the land occupied/cultivated by the displaced populace is just 659 ha, comprising 22% of total land to be acquired and used by the project. In order to resettle the displaced people, the project will be providing land in lieu for the cultivated land in Nepal. In this manner the project will be using Nepal’s additional land for the purposes of resettlement. However, the project has no plans to provide land in lieu of remaining 2345 ha of land (3004 ha minus 659 ha) that the project is to use. An important question that arises is why Nepal should sacrifice 2345 ha of its land to provide good quality low cost power to India, which will also enjoy the benefit of flood control in rainy season and augmented flow in the dry season. Currently 1,630 ha land gets submerged completely and 645 ha partially every rainy season in Banke district in Holiya, Bethani, Gangapur, Matehiya and Phattepur VDCs due to Laxmanpur barrage built by India during monsoon (Dhungel and Pun, et al 2009). According to Dr Anand Bahadur Thapa (2009) “the controversial Laxmanpur barrage located very close to Indo-Nepal border is a direct extension of the West Seti storage dam project. People of Banke district are already suffering from the partial submergence after completion of the Laxmanpur project. The flooding situation would greatly worsen once the West Seti project starts to operate.” Upon completion of this project the area will be submerged in the dry season too (as there will be additional water in the barrage in the dry season) resulting in submergence throughout the year due to the augmented flow. This aspect is not covered by the EIA report and, therefore, no resettlement and rehabilitation plan has been put in place. This impels one to wonder if the project proponents have disclosed full facts about the project to Asian Development Bank – principal financier of the project. However, Mr. Shiv Kumar Sharma, Regional Director, Mid Western Regional Irrigation Directorate, under Ministry of Water Resources (located in Surkhet) disagrees with Dr Thapa’s contention and opines that Laxmanpur barrage will not cause additional inundation in Banke district during dry season. The inundation/submergence described above displaces 18,269 (WSHL 2007) people according to the EIA report referred to above. The proponents of the project claim to have put in place a plan to resettle and rehabilitate these people. However, the project doesn’t have any plan to resettle 15,174 people that will be displaced completely after this project comes into operation due to Laxmanpur “barrage” in India (Dhungel and Pun, et al 2009). Clause 7.2(d) of the Project Agreement and Rule 20 of Electricity Regulations, 2050 puts restriction on consumptive use of water in the upstream area in order to ensure adequate water for the project to generate electricity. 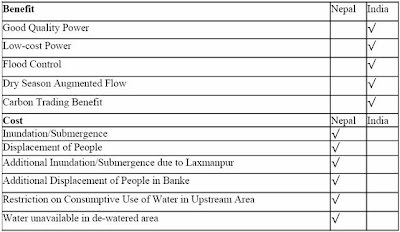 This restriction adversely impacts following VDCs which will not be allowed to use water in the upstream area for consumptive uses like irrigation etc: Rayal, Dangaji, Parakatne, Bhairabnath, Chaughari, Kotbhairab, Malumela, Matela, Subeda, Luyata, Hemantabada, Chainpur, Sunkuda, Banjh, Khiratadi, Dahabagar, Pipalkot and Kapalseri in Bajhang District, Belapur in Dadeldhura District, Shivalinga, Dhungad, Sigas and Thalakada in Baitadi District and Lamikhal, Mahadevsthan, Dahalkakikasthan, Girichauka & Chhapali in Doti District. The project people are trying to undermine the importance of the issue by saying that there will not be any restriction on drawing of water by the people in these villages for the purposes of drinking. The important issue here is the water for irrigation purposes. Due to the restriction imposed by Clause 7.2(d) of the Project Agreement and Rule 20 of Electricity Regulations, 2050 no new irrigation work will be allowed to be undertaken in these villages. Their attempt to obfuscate the mater will not help the project. Rather, this is the best way to lose their own credibility in the eyes of the people adversely impacted by the project in particular and others in general. The project will be diverting water around a 19.2 km river section and this patch of the river will become dewatered. Water will become unavailable for use by locals in such de-watered area. Bayarpada, Banlek, Jijaudamandu, Latamandu and Pachanali VDCs in Doti District and Belapur in Dadeldhura District will be adversely impacts. The environmental flow of 10% that the project is required to leave in the dewatered area will not be adequate for the residents of the villages on the banks of the dewatered river to undertake irrigation work. From the above table it is clear that all of the costs have to be borne by Nepal while benefits go to India making one wonder why Nepal is allowing implementation of such a project. The question that occurs to patriotic/nationalist Nepali people is why should Nepal sacrifice 4,634 ha of land permanently and 645 ha partially (including submergence in Banke district which has not been accounted for by the project proponents) in order to provide (a) good quality power at low cost, (b) flood control in the rainy season and augmented dry season flow free of cost to India and (c) also carbon offset benefit to India. As a country there is sense in inundating its land mass in one area in order to benefit other area in terms of flood control and augmented flow which will help increase cropping intensity, including off season planting of high value agricultural produces. But that is not the case here. Inundation happens in Nepal and benefits accrue to India. There is no doubt whatsoever that the storing water during the rainy season in the reservoir built for electricity generation will augment the flow in the Seti River in the dry season and, consequently, in Karnali in Nepal and Ghagra in India substantially. As 75% of the dry season flow of Ganga River is contributed by rivers in Nepal, Karnali being one of the major ones, the incremental flow will be significant. Only issue that needs to be settled is the quantum of such augment flow, objectively. Dr Anand B Thapa, an eminent scholar, has opined that it will amount to 90 m3/s while others feel that this is slightly overestimated quantum. The issue that needs to be debated is not how much will be augmented – which can be scientifically assessed – but why should Nepal have its land, forest, infrastructure, etc. submerged and have its populace displaced in order to provide additional fresh water to India free of cost. There are people in Nepal who are happy to surrender everything to India, even Nepal’s sovereignty, while paying lip service to the spirit of working to the best interest of Nepal and its people. But the majority, thankfully, will never agree to the sell out of Nepal’s interest in any form. Unfortunately, the majority is neither well informed nor is in a position to stop the hydrocracy (politicos, bureaucracy and intellectuals involved in water resource sector development) from signing away Nepal’s interest, in treaty after treaty; manifesting in the treaties for Nepal’s major rivers like Koshi, Gandaki and Mahakali. That was a phase where such bi-national treaties were signed and a lot of controversy raised. These people, with the inclusion of Article 126 in the Constitution of 1990 (Article 156 in Interim Constitution), requiring ratification of such treaties by simple majority in the case of treaties of ordinary nature and by two-thirds in the case of treaties that affect the nation extensively, seriously or in the long term, have changed track. They are now putting forth fronting companies which secure Indian interest in Nepal’s water by getting licenses for hydropower. Thus in the name of hydropower development, Nepal’s land, forest, infrastructure, etc. is submerged and have its populace displaced to provide flood control benefit and augmented flow in the dry season free of cost to India. India's the then union water resources minister Mr. Saif Uddin Soz had been frank and honest in admitting, with Navin Singh Khadka, BBC Nepali Service, 12 September 2008, that “Our main interest is flood control and irrigation. Those are our first and second priority. If we get hydroelectricity as by product, that will be a bonus for us.” This is the first time that an Indian official (of highest level) has been candid in admitting as much. Surprisingly, however, this has yet to be understood by Nepal’s hydrocracy. Or it may be a case of them pretending not to understand it, in order ensure that Indian interest is served by implementing projects in the name of hydropower that afford flood control benefit and augmented flow at no cost to India. What galls ordinary Nepali citizenry is the fact that these people parrot the statement that they are working to serve the best interest of Nepal and its people while betraying the nation and the population no end. Some proclaim that Nepal does not have exclusive right over water flowing in rivers in Nepal as they deem these as international water course. Even if one was to accept the logic of international water course, the augmented flow will not be the “same” water. What the proponents of this concept need to understand is that the augmented flow generated by storing it in a reservoir inundating Nepal’s land is the water with temporal value added at Nepal’s cost. Therefore, Nepal is entitled to the “value” that has been created/added by way of storage of such water in Nepali territory. The problem lies in their mindset that the water flows down to India anyways. The water that flows down during the normal course is the water which is devoid of any value addition. Such water even causes flood during rainy season. But by building a reservoir additional value will be created/added on the free flowing water. Therefore, Nepal is entitled to a “fee” for the value added as such. People advocating to provide such value added water to India free of cost can in no way be deemed to be working for the interest of Nepal and its people. This thinking on their part is the other half of the oxymoron statement that the water normally flowing in the river is waste of “valuable” water. They don’t tire of attributing value (hence the relevance of wastage) to the naturally flowing water which is bereft of any value addition (neither spatial, nor temporal) but are adamant to bestow value added water free of cost to India. What has been said by the project proponents (echoed with glee by Nepal’s hydrocracy) is that Nepal will receive a project worth $ 1.2 billion, free of cost in 30 years. This has got a cross section of Nepali hydrocracy enthralled which has succeeded in spreading the contagion to the uninformed general public. It needs to be remembered that the present value of $ 1.2 billion, discounted at the rate of 10%, to be received 30-year hence is just $ 68.77 million – not a huge amount worth to be excited about. Similarly, looking at it from another perspective, depreciated value of the asset worth $ 1.2 billion today in 30 years is just, again, $ 48 million (after depreciating the property for 24 years, with 25 years as the economic life of the project). As the old saying goes, it will be tantamount to people going about bragging about having put on some weight while it was merely a case of swelling of the body. Because, thirdly, by then, although the civil works part may be in a fairly good condition but same will not be true in the case of hydro and electro-mechanical equipment which will have to be replaced in about 25-30 years. On the contrary Nepal stands to be shortchanged of $ 2.075 billion (at current price level) for the augmented flow of water over 25 years, even if Nepal is to get back the augmented flow too after the handover of the project. Similarly, Nepal also is not going to receive $ 34.5 million for the carbon offset during 25 years operation of the plant that she is entitled to. Moreover, it also needs to be remembered that this calculation does not take into account the power benefit that is due to Nepal. Besides, there is the issue of decommissioning which both the hydrocracy and the project people don’t like to talk. Although the main source of Kulekhani reservoir, for example, is not based on silt laden river, the dead storage of this reservoir is already 25%. In other words, the capacity of Kulekhani reservoir has diminished to 75% of original capacity in about 2 decades. Same (the role of silt) can also be seen from the rise of river-bed of Koshi River by 4 meter, by now, compared to the level of the land in the surrounding area. Seti too carries high silt load and West Seti project will transform into a RoR project from the reservoir project in about 30-40 years. At that time, after getting it handed over to Nepal, this project’s dam will have to be decommissioned. As the private sector has not provided any budget for this purpose, the government of Nepal will be forced to spend money for this purpose. Meaning, when Nepal is supposed to be “enjoying” electricity from this project handed over free of cost, she will be forced to shell out money for decommissioning which will cost more than the initial investment to build this project. An objective assessment of a project also needs an assessment from economic perspective. The best way to do so is by examining/analyzing various linkages to the economy like backward, forward, investment and fiscal linkages of the specific projects and evaluating the contribution to the national economy in terms of percolation coefficient. Implementation of a hydropower project entails investing huge amount which results in backward linkage, provided that the amount invested as such percolates into the economy. Similarly, commissioning a hydropower project results in forward linkage and percolation coefficient from it depends on the use of the output (electricity) from it within the economy. An economy can also benefit from investment linkage depending upon the flow of return on investment from the hydropower project – whether it percolates within the economy or without. Finally, national treasury benefits from fiscal linkage due to the implement of the project to the extent of various rates and taxes paid by the project. Hydropower projects are of capital intensive nature, entailing high initial investment. Depending on the nature of backward linkages of a specific project, the contribution of each project to the country’s economy can be assessed by evaluating how much of the initial investment is retained by the economy, resulting in employment generation, higher level of industrialization, increased contribution to foreign exchange reserve, capacity enhancement and capital formation. Absorption capacity of the economy also dictates the value/volume of the backward linkage. If the full amount of investment for this project is to percolate into Nepal’s economy, she would definitely benefit substantially. Obviously, if closer to a hundred percent of the initial investment percolates into the economy, the contribution of such a project to the economy due to backward linkage will be very high. Conversely, if the economy is able to retain very little of the initial investment then the benefit accruing to the economy from such a project will be proportionately low. From this perspective, a project which makes substantial contribution to the economy due to backward linkage is good for the country and vice versa. Let’s examine the percolation coefficient due to backward linkage of this project. According to Table 1 above, implementing this project entails investing $ 1.097 billion. Of the total cost of civil works of $ 469 million, most of it will be incurred for the procurement of cement, steel bars and other construction materials. Although there are two cement factories (other factories mainly grind imported clinker and fill in the sacks) the production capacity of these are not adequate even to meet the present domestic demand. And there also are a number of factories producing steel bars in Nepal but these too are unable to meet domestic demand (and, moreover, as these use imported raw materials, the percolation from the use of such steel bars into the Nepali economy is very little). Therefore, the requirement of this project will have to be met by the imports. The project will, however, be able to source for gravel, aggregate, sand, etc. within Nepal and it is estimated to cost about $ 1 million. The resettlement entails purchasing land and building houses for the displaced populace and the land is expected to cost 50% of the budget and construction materials also 50%. Project management, to be the responsibility of SMEC, is expected to be predominantly expatriate affair and about 10% is expected to be spent on the technocrats from Nepal. SMEC has been making it public that 5,000 unskilled workers are expected to get employment during the construction period (as have been seen during the construction of most of the hydropower projects, most of the skilled workers will be sourced from foreign countries). Over the construction period, lasting 5.5 years, the workforce at the construction site will be relatively small in the initial years which will peak during the 4th year and will taper off as the time of commissioning of the plant nears. Therefore, it is estimated that the construction of the project will entail 165,000 worker/months. Total payment to the workers over the construction period is estimated to amount $ 15 million at the rate of Rs 6,000 per worker/month. In this manner, of the total initial investment of $ 1,097 million, about $ 39 million will be spent in Nepal – resulting in percolation coefficient of 0.0356. Therefore, the employment generation, level of industrialization, capacity enhancement and capital formation will be limited by this percentage. In the similar vein, although this project entails foreign direct investment of $ 1,097 million but the contribution to foreign exchange reserve of Nepal (another form of backward linkage) will too be limited to $ 39 million that will be spent in Nepal. Rest will come to Nepal as the foreign direct investment and will desert the country immediately due to outlays in foreign countries. Had the absorption capacity of Nepali economy been better, the percolation coefficient of this project from backward linkage would have been higher. Conversely, percolation coefficient of other projects which are not too dependent on foreign sources will be higher. An ideal hydropower project from this perspective will result in 0.5 or more percolation coefficient. Another important way a hydropower project can benefit an economy is due to the forward linkage benefit which entails using the electricity domestically. Use of electricity by an economy results in the multiplier effect on the economy resulting in employment generation, higher level of industrialization, increased contribution to foreign exchange reserve, capacity enhancement and capital formation. The electricity, upon it becoming available, can be used in all sectors. It can be used, for example, in agro-processing, like tea which is currently processed using furnace oil or firewood. With this one change economy will benefit from decrease in import of fossil fuel that drains hard currency, decrease in deforestation and decrease in environmental pollution. Similarly, by using electricity for irrigation, farmers, consequently the economy can benefit due to increase in cropping intensity, plantation of cash crop, off season produce, etc. If the electricity generated from a project like West Seti is to be used domestically, the forward linkage benefit to Nepali economy would have been tremendous. In order to simplify the matter, as only 10% of electricity generated from this project will be available to the Nepali economy, we can conclude that the percolation coefficient of this project is 0.1 on account of forward linkage. On this issue, too it is curious that this project, that not only generates good quality electricity at low cost but also generates flood control and augmented flow, the free energy given is at the lowest level. Upper Karnali and Arun III projects have offered 12% and 21.9% free energy respectively. From the above it is clear that use of electricity generated by a project results in import substitution to an extent and, therefore, positively impacts foreign exchange reserve, too. However, there are “economists” who believe that exporting electricity from such a project to India helps mitigate the problem of balance of payment deficit of Indian currency – to the extent of total revenue generated by this project by exporting electricity. This, unfortunately, is untrue which can be substantiated by looking at future cash flow of the project subsequent to its commissioning. For the duration of debt service period of about 15 years, of the total revenue generated by this project a large portion will be used up in the payment of interest on the debt and repayment of a part of the principal. Anything left after meeting the debt service requirement as such and operation and maintenance cost will be distributed as dividend of which only 15% will reach Nepal. However, as Government of Nepal is borrowing money to invest in the equity of this project company, most of the money from dividend in the hands of GoN will be spent in meeting this part of the debt service obligation. Therefore, the only “foreign exchange” that will enter and stay in Nepal in the first 15 years of project operation are the energy and capacity royalties, which adds up to about 2.89% of the total export revenue in the case of this project (this is further elaborated under fiscal linkage below). In the case of West Seti, as all debt is being sourced from foreign financial intermediaries and all equity investors are foreigners, except for 15% of GoN, almost all of the return on investment will not percolate into Nepali economy. If the GoN was to take up 15% equity in this project from domestic sources, at least 3.75% of the return from the project would have accrued to Nepal. But, as GoN is borrowing money to invest in this project whatever dividend GoN will receive from this project will flow right back to the lender in debt service (repayment of part of the principal and interest on the loan outstanding). Therefore, the percolation coefficient on account of investment linkage is 0.01. The fiscal linkage of a project to the economy of the country manifests in its contribution to the treasury – in the form of payment of various rates, taxes and duties. During the operational period, this project is required to pay capacity royalty of Rs 100 per kW and energy royalty of 2% of the revenue during first 15 years of the project operation which amounts to 2.62% of the turnover (whereas Upper Karnali and Arun III projects are required to pay royalty at the rate of Rs 400/kW and 7.5% as energy royalty). This project also is required to pay a very meager export tax of 0.05% of the revenue; in total paying 2.67% as royalties and export tax (Rs 324 million) each year after commissioning. Moreover, as the tariff fixed for export of power from this project is merely US 4.95 ¢ while NEA is importing at around US 9 ¢ from PTC India the government revenue from energy royalty to Nepal is commensurately low. Nevertheless, one should accept the rates agreed by GoN regarding royalties and export tax. But for failure to ensure downstream benefit to Nepal, deprives Nepal of Rs 6 billion/year. Conversely Nepal would have received Rs 6.324 billion altogether if Nepal is to succeed to get recompense for downstream benefit. In view of this the percolation of coefficient of fiscal linkage is 0.0512 only. The percolation coefficient in each type of linkage could have been higher (closer to 1) but for the structuring (should not be confused with the physical structure of the works) and/or packaging of this project. Alternately, India should provide land in exchange of inundated/submerged land of over 4,000 ha pursuant to precedent set by Sarada Agreement of 1920, the 3rd clause (Pun 2008) of which reads: “That the Nepal Government would transfer necessary land for the construction and maintenance of canal works which is provisionally estimated at 4,000 acres and would receive land equal in area from the British Government.” because, the inundated/submerged land under the reservoir will never become available for economic/productive uses by Nepal. If above structure is unacceptable to the proponents, then the project should be structured as described in following lines. It should be built as a multipurpose project in order to irrigate land in Nepal and the dam height should be fixed according to irrigation need of cultivable land in Nepal. Therefore, the inundation/submergence of land in Nepal should be commensurate to the extent of Nepal’s irrigation requirement only. The electricity should be used to meet Nepal’s need of peak-in energy demand and export only excess energy to India, not power. 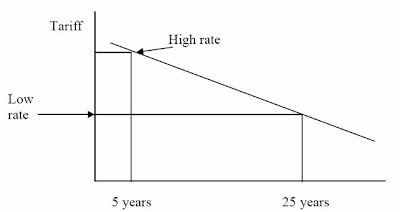 Besides, as long term PPAs yield low tariff (and vice versa – depicted by the diagram above), no long term PPA should be executed. Only short term PPA should be signed with an eye on Nepal’s need. This is no more true. The meeting of the Parliament’s Natural Resource and Means Committee held on July 17, 2007 has resolved to direct government of Nepal to arrange to receive 10% free power – not revenue in lieu of it. Vernacular daily “Kantipur” (Kathmandu), May 25, 2009. See Table 3, ‘Land Use on Sites to be Permanently Acquired.’ in WSHL 2007. First signed away in the name of MoU for Tanakpur power project, but after the intervention of Supreme Court, in the name of package deal, Nepal was betrayed by signing a treaty for the whole Mahakali River which was even ratified by the Parliament – an act of national betrayal. A transcript of the interview has been published in Nepali Times weekly, 19-25 Sept 2008, #418. NEA is paying about US 8 ¢ for electricity generated by RoR projects in Nepal. As this project is slated to sell electricity at rock bottom prices, Nepal’s revenue from this project, no wonder, is low on this account too. It should be interesting to note that Tripura in India proposed to export electricity to Bangladesh at INR 7 (equivalent to US 16 ¢). Pun, S.B., 2008, ‘Whither Indo-Nepal Water Resource?’ in Part V, Vidyut (half yearly edition) 19(1), (August). Shani, Wallis, 1992, Lesotho Highland Water Project, Surbiton, Surrey, UK: Laserline. SMEC, 1997: Detailed Engineering Report of West Seti Hydroelectric Project, Australia: SMEC International Pty. Ltd.
Thapa, A.B., 1995, ‘West Seti benefit could turn into a desert mirage for Nepal’. WECS Bulletin 6, May. Thapa, A.B. 2008, ‘International Water Right Principles’, Newsfront (Kathmandu) 84, (15-21 September 2008). URL : www.bhrikutinews.com/newsfront/. WSHL, 2007, Environmental Assessment Report of West Seti Hydroelectric Project, Report to Asian Development Bank, New Delhi: West Seti Hydro Ltd.